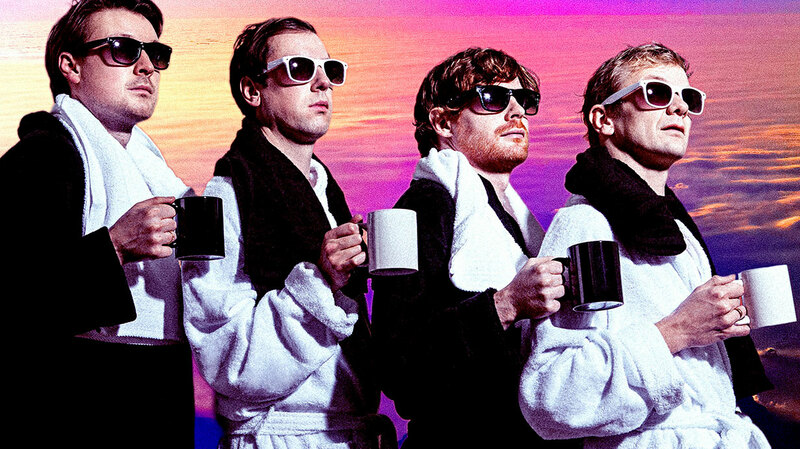 Recorded on a shoestring budget, Django Django’s self-titled debut went on to become one of the most critically-acclaimed British albums of the decade, with sales of over 100k. Three years on, the Mercury Prize-approved art-pop quartet are back, and are setting their sights even higher with the follow-up. Here, bassist Jimmy Dixon explains how John Lennon, Tom Wolfe and Buddhist chanting all played a part on their second LP, Born Under Saturn. Congratulations on the new album. Considering the success of your debut, are you at all nervous about the release of Born Under Saturn? A wee bit. During the whole process of writing, we didn’t really feel much pressure; we were just getting on with it. But, I mean, you spend so long on something and the closer it gets to the release date, the more nervous you get. Mostly, I think we’re all just excited to get it out now, and start playing some of the songs live. How soon after finishing up touring your debut, did you start work on Born Under Saturn? Pretty much straight away. We had our last gig up in Edinburgh for Hogmanay on New Year’s Eve 2014, and a week or so after that we were all back in London, writing at home and meeting at the studio. We didn’t set an amount of time aside to go away on holiday, because I think we were all just really keen to start writing again, you know? When you’re trying to concentrate and all you can hear is Buddhist chanting above you, it’s pretty consuming. You toured your debut heavily. How much impact did all that live experience have on the sound of Born Under Saturn? I think we definitely tried to bring a little bit of the live element to this album. With the live set, the songs almost become works in progress, with us adding things to the start or extending bits at the end. We definitely tried that on a couple of tracks [on Born Under Saturn], but I think we still pretty much worked in the same way as the first album. It’s just the way we work as a band: we don’t really sit down and learn a song, and record it as a live band. Instead, we’ll record all these different parts and then put them together and chop bits up. Working like that also means that, when we do play live, we have an opportunity to rethink the songs again, which hopefully keeps things exciting and fresh. Is it a totally collaborative creative process? Yeah, and much more so than the first record. With that album, most of the tracks were demoed by Dave [Maclean, drums/production] and Vinny [Neff, singer/guitarist] quite early on, and then me and Tommy [Grace, synths] came onboard towards the end of the process, mainly putting parts down for a few of the later songs. But with this record we worked as a unit. We got into a routine of me, Tommy and Vinny going into the studio with ideas that we’d all been working on, and just working our way through songs and lyrics, and recording ideas, and then Dave would come down in the afternoon and take things apart or scrap things that weren’t working. It was really nice having that fresh pair of ears, and I think working collaboratively allowed us to not become too precious over ideas. Was there anything about the process you purposely approached differently? Yeah. We went up to a live-in residence studio up in Oxford for half of the recording time, which basically meant that we could use their amazing recording equipment. Also, having that set-up meant that tracks moved a lot more rapidly, because ideas changed a lot quicker. With the first album, we had a couple of mics and loads of broken equipment so it was a lot of us cobbling things together. With this album the only thing that we had in our minds was to record it in a much more confident way. And I think that by being able to go to this studio where we could spend three weeks just working – rather than having to take an hour here and there – was a major help. Sonically, were there any goals for the record? No, we just allowed ideas to develop and purposely didn’t impose any restrictions. We’ve all been to art school and the one thing that really gets drilled into you is that you shouldn’t approach any creative project with a set of ideas of how things should work out. You’re setting yourself up for failure if you do that. So, as a result, there are songs on [Born Under Saturn] that sound at the opposite end of the scale to each other, but I think by embracing that and making them our own they all stick together. From your regular Facebook updates we know that you're huge music fans, with very diverse tastes. Were there any influences for this record, either conscious or subconscious? I think in the early stages it was about songwriting. On the first album, Vinny had had ideas for verses, and we would get to the chorus and it would just stop, so we’d end up putting a drum break in there. This time we wanted to write songs that were structured a lot better, with choruses, middle eights and bridges. So, in the early stages, I listened to a lot of 70s songwriters, like Harry Nilsson, John Lennon and Gerry Rafferty. But once we’d got into the studio we took those songs apart and made them sound like us. The title of the album is taken from a book of arts criticism by Rudolf Wittkower, which deals with idea that artistic inspiration is a form of madness. Why did that resonate with you? Honestly, I think it’s a coincidence. Dave was working on a play called ‘The White Devil’ up in Stratford, and he saw it in a book store one afternoon. I think he picked it up because he thought it was going to be some sort of book on astrology or something, and he just liked the title. It was around the time when we were looking for an album title, and we just knew that the title needed to be something quite strong, because we already had the image of the statue for the cover artwork. The statue itself is called ‘The Sluggard’ [by Lord Leighton Frederic] and it’s quite an important sculpture because, unlike most of the sculptures of that period, it isn’t a really masculine, strong pose; it’s basically a man waking up. So while it was just a coincidence that Dave found that book, it does seem to marry with the image really well. Lyrically, were there any other cultural reference points? Yeah. To be honest, the way we write lyrics is that we will pick a subject, and just to try to write a song about that specific subject or narrative. That means there aren’t really any particularly personal lyrics in the songs, which means that we can all take these ideas away and start working on them, and that we don’t get too precious over them. There’s a song called ‘4000 Years’ that me and Tommy wrote the lyrics for, and that was inspired by an essay by Tom Wolfe on Las Vegas. We thought it would be fun to write a song about Las Vegas from the point of view of the city, if it could talk and communicate to people. So we took that as a starting point and just went with it. With ‘Vibrations’, I think Dave had sampled some bird noises on the demo, so we decided to tell a story of a guy searching for birds of paradise through this jungle. You personally wrote ‘Beginning To Fade’. Can you tell us more about that track, please? That was one of the earliest songs to get finished and I’d written it at home, really early on in the whole process. Because I didn’t contribute any lyrics to the first album, that track was a really early effort of trying to write. I was just sat at home trying to think of a story or something to tag these lyrics to, and I just ended up writing about the things that were distracting me. So it became this song about writer’s block and about not being able to start something. Also, my flat mate at the time – who lived in the room above me – was a Buddhist, so I could just hear him chanting all day. As a result, there are references to mantras and things like that. That’s a really unusual distraction to have. Yeah, it was really, really weird. And when you’re trying to concentrate and all you can hear is Buddhist chanting above you, it’s pretty consuming. So what’s the plan for the rest of 2015? Touring. We’ve got gigs and festivals and a European tour, so the rest of the year is pretty much planned out for us. But I think we’re all really excited to start playing live again, and once we finish touring we’ll be just as keen to get back in the studio and start writing. Are there any side projects in the pipeline? Well Dave’s got his 12" record label [Kick + Clap] which is ongoing. I used to live with Nick McCarthy, who plays guitar for Franz Ferdinand, and me and him have been doing a bit of recording in London for his wife’s band. We were also talking about potentially doing some more recording during the year, but I suppose it just depends when we’ve got time. Hopefully, we won’t be touring so much that we can’t carry on being creative. Finally, is there anything that you think you’ve particularly learned about yourself in the making of this record? I think we’ve learned quite a lot. I mean, we’ve almost had to learn how to work together properly, as a four-piece. And I think we’ve all just become a lot more confident in writing songs and in our decision-making, and I think that comes across; to me, it sounds like a much more confident album.